It doesn't feel like fall at all here in Florida, it's hot and our air conditioner at home is on day and night. I am still into fall foods especially anything pumpkin and had a pumpkin flavored coffee and pumpkin muffin yesterday. :) I made a fall bento for Nikolai today since by the calendar, fall season has started. This bento is packed in our Laptop Lunches. Lower left - Cucumber in leaf shapes above organic baby carrots. Lower right - SunButter sandwiches in squirrel and acorn shapes. Squirrels tails are from pumpernickel bread. Acorns are from bread crust cut and stamped with a fall pie press cutter which I purchased from Williams-Sonoma last year. Far right - A cloth napkin. Linked to Bentoforkidlet Meatless Monday. What an adorable lunch! Fall is my favorite season!! Love your fall theme! It looks like it would be so much fun to eat! Love those squirrels and acorns. So cute! the corn shapes are sooooo cute! This is so cute! I just love Fall! The acorns n squirrels are so cute!! I'm loving the squirrels and acorns-It doesn't feel like Fall yet but it's my favorite season. I wish the fall weather would be here already! 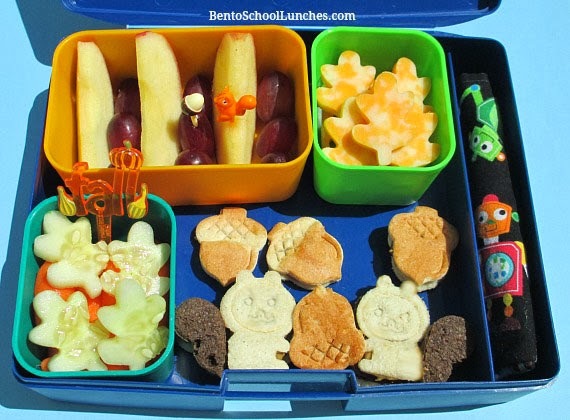 I so want to make bento lunches for my daughter next year. I love looking at all your lunches and think it is great that you share. Love the school picture one and my daughter really likes squirrels.